Janice Ross, 56, left, says she has lived on Skid Row for the past two years. 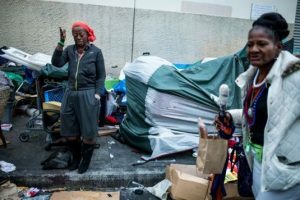 She is among the 30 percent of women who are homeless according to Los Angeles Homeless Services Authority’s homeless count. This month, Los Angeles opened the first of 15 new homeless shelters. It’s the start of a radical plan to bring emergency housing to homeless people where they’re already living and to bring services tailored to each neighborhood’s needs. This is good news because far to many people are homeless and living downtown Los Angeles. I remember when President Clinton came to town the city hide this problem from the media, and gave it a bandage to cover up what was really happening. These new shelters will help many women and children and I thank the mayor for making this a reality.